Initial observation: As previously established, duck eggs have larger yolks (and thus greater fat content) than chicken eggs. Question: How does the use of duck eggs in baked goods affect the end results? Expectation: It is commonly touted that duck eggs produce baked goods that are moister, and richer, than when made with standard chicken eggs. Given previous results quantifying the volume and yolk size of chicken vs. duck eggs, that seems like a reasonable claim. optional (? ): frosting! Here at the primary testing facility we are fond of the Dream Whip frosting “recipe” … it is not overly sweet and the flavor can be varied by simply picking any of the available instant puddings at your local food purveyor. 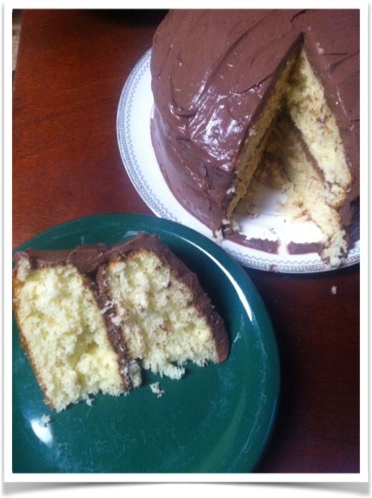 finish baking, remove from oven, cool as directed, construct a cake, consume & enjoy! bake as instructed, remove from oven, cool, imitate cookie monster & enjoy (om nom nom!). Both of the cake layers were nearly the same temperature when removed from the oven (206°F for the chicken-egg layer, 204°F for the duck-egg). The height of the finished cakes were slightly different, with the duck egg version obtaining slightly higher maximum elevation (1.31″ vs. 1.25″). For taste testing, Brownie Master P and Co-blogger/Science conspirator F were presented with the finished & dressed cake, and were not informed about the layer identities. Both “blind” testers , preferred what was the duck-egg layer. It was determined that there were no obvious textural difference, but the there was a slight flavor difference, with the duck egg layer being considered more flavorful. Cake where the upper layer was made with duck eggs and the lower layer with chicken eggs. As the testing facility hosts a low permanent population (most of whom are obligate carnivores), the cake constructed for this experiment lingered for a while in the fridge. It was noticed that after a week or so, the duck-egg layer was noticeably more moist than the Chicken-egg layer. This may be a result of the upper cake layer having a larger frosted surface area than the bottom layer (I don’t frost the bottoms of cakes, not even for science), but the keeping characteristics of duck vs chicken egg goods should be tested further. The preferences were subtle, but duck eggs had a slight edge over the chicken eggs in both the cake and cookie tests. The cake constructed with the duck eggs were slightly loftier, and the duck egg cookies were considered chewier, fluffier, and lighter in color (and overall “prettier”). 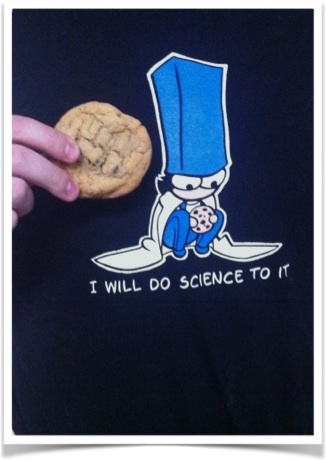 Doing science to baked goods is a great reason to bake! In case you are interested, T-Shirt can be obtained here and is from this web comic. What was the source of the chicken eggs? There is a significant difference in quality between chicken eggs from the supermarket vs. a small operation (like where it sounds like your duck eggs came from). Were the two types of eggs of comparable quality? Unfortunately I did not have a handy source of chicken eggs at the time other than the supermarket. Based on a simple visual assessment I believe they were about the same (based on prominence of the yolk and egg white spread), but the basic physical differences between duck & chicken eggs might make that harder to assess accurately. There are a lot of quality aspects that can’t be seen (types of fat, Omega 3 fatty acid ratios, micronutrients, etc…), so without some real lab equipment I don’t think I can say anything quantitative. I do have a friend with hens that might be laying again in the summer, and I would be happy to do a generic supermarket chicken egg, fancy supermarket chicken egg, vs. backyard ranging hen egg taste test then! Great! I’m looking forward to seeing the results of that chicken egg comparison! We bought ducks this year. We also have chickens. I am going to experiment also. I don’t like to eat plain duck eggs…..too hard to not overcook and become rubbery.